Wooden Chest. WOODEN CHEST. Trunk is made from high quality pinewood and plywood. 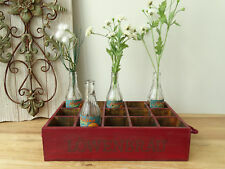 This chest is perfect for storage toys, bedding, blankets, clothes, shoes, bags, books, minibar and other. On sides are two handles space so you can carry it very easy. Stil Shabby. Length: about 40 cm. Länge 40 cm. Width: 25 cm. Tiefe 25 cm. Höhe 10 cm. Good condition (just like on the pictures). Made from natural willow these wicker. Wicker Chest Storage Trunk. Deep - 50 cm (20 "). painted Red. 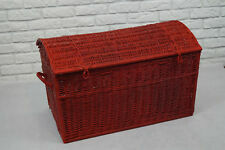 We Have Other Wooden/Wicker Accesoriess Available. Great trinket or even fishing box. 2X(Pirate style treasure chest. ). 1X(Pirate style treasure chest. ). 1X(WOOD pirate style treasure chest. ). China red chest laundry box box to carry delicate lattice surfaces only by Luxury Park. Great designed airy chest, wooden trunk, transport box for cats, dogs and small animals. The chest is very versatile. UNION JACK STORAGE BOX. These large, bright and colourful storage chests are ideal for storing toys or clothes in your childs bedroom. Perfect for kids bedroom, playroom for storing toys, clothes etc. Painted wooden box, like small chest - red, 22 x 13 cm / ca 12 cm high (90472). Refer also Hans_der_Baer. 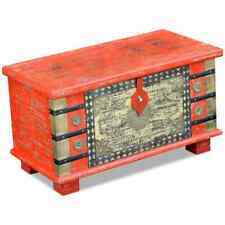 Wooden Storage Chest Ottoman Blanket Toy Trunk Box Wheels Mango Asian Style Red. Material: Solid mango wood. This striking Wooden Storage Chest will make a great addition to any living space, and it will help you to keep clutter at bay. Bed Mattresse -Divan Footboard. Add to Favourites. price :£ 194.42. Chests of Drawers. Cabinets & Cupboards. wall lights. ceiling lights & chandliers. Having a rustic distressed finish. At Four Seasons Liverpool we aim to bring you the highest quality and choice. We hold a large range of Shabby Chic, Oak, French, Modern and Venetian furniture. lighting and accessories. 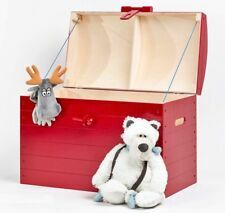 WOOD pirate style treasure chest. Pirate style treasure chest size: 23*16*7.5cm The hasp made the chest closely. PERFECT FOR keep makeups and jewelries, store holiday cards, tarot decks, save keeping, remotes and stuff in the living room, filling with travel momentos, put on dressers. Great as a gift, part of a Christmas exchange, memory box for the wedding or a personalized jewelry box and the "wrapping" or gift box. WOOD pirate style treasure chestTrunk measures approx. 23*16*9.5cm/ 9 x 6.3 x 3.7 inch, INSIDE:8.4x5.5x3.0 inchThe hasp made the chest closely. Great as a gift, part of a Christmas exchange, memory box for the wedding or a personalized jewelry box and the "wrapping" or gift box.PERFECT FOR keep makeups and jewelries, store holiday cards, tarot decks, save keeping, remotes and stuff in the living room, filling with travel momentos, put on dressers.Color:Wine Red Package Contents: 1 x Jewelry storage boxNote: Light shooting and different displays may cause the color of the item in the picture a little different from the real thing. The measurement allowed error is /- 1-3cm. MPN Does not apply Brand Unbranded Designer/Brand Unbrande. Pirate style treasure chestsize: 23*16*7.5cmThe hasp made the chest closely. PERFECT FOR keep makeups and jewelries, store holiday cards, tarot decks, save keeping, remotes and stuff in the living room, filling with travel momentos, put on dressers.Great as a gift, part of a Christmas exchange, memory box for the wedding or a personalized jewelry box and the "wrapping" or gift box.Color:RedPackage Contents: 1 x Jewelry storage boxNote: Light shooting and different displays may cause the color of the item in the picture a little different from the real thing. The measurement allowed error is /- 1-3cm. MPN Does not apply Brand Unbranded Designer/Brand Unbranded EAN 192090076802 ISBN 192090076802. WOOD pirate style treasure chestTrunk measures approx. 23*16*9.5cm/ 9 x 6.3 x 3.7 inch, INSIDE:8.4x5.5x3.0 inchThe hasp made the chest closely. Great as a gift, part of a Christmas exchange, memory box for the wedding or a personalized jewelry box and the "wrapping" or gift box.PERFECT FOR keep makeups and jewelries, store holiday cards, tarot decks, save keeping, remotes and stuff in the living room, filling with travel momentos, put on dressers.Color:Wine Red Package Contents: 1 x Jewelry storage boxNote: Light shooting and different displays may cause the color of the item in the picture a little different from the real thing. The measurement allowed error is /- 1-3cm. Brand Unbranded MPN Does not apply UPC 192090076833 EAN 19.